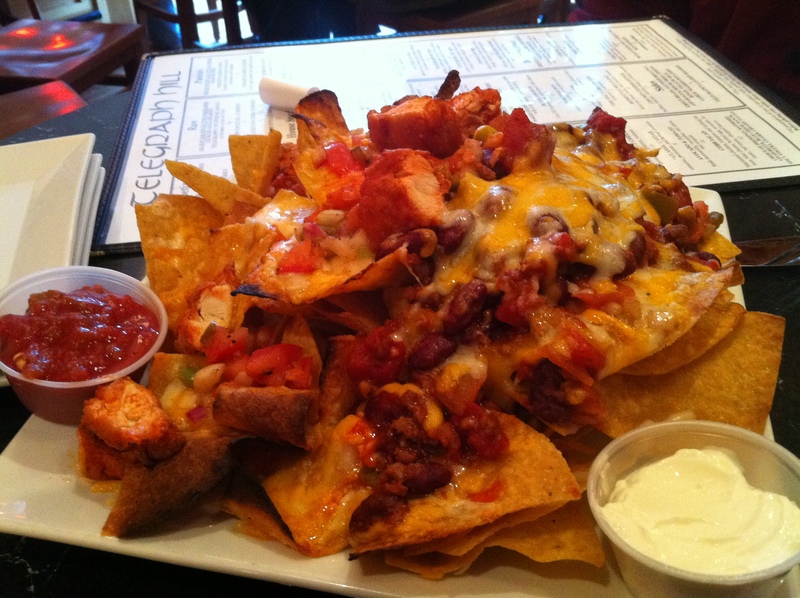 Telegraph Hill: Good Nachos. Stop. Too Expensive. Stop. Just around the corner from our first Southie review, the little gem named Telegraph Hill is the perfect microcosm of the gentrification of South Boston. A year ago, it was a grubby townie dive where, according to the current owner, no matter which tap your beer was poured from, it originated from one of a row of kegs of Natty Light in the basement. Now, it has done a complete 180 with a semi-creative draft list and upscale and updated comfort food. The first thing that struck this Nacho Patroller upon entering is how… clean the place looks, all bright lights, big windows and shiny wood. How often can you say that about a bar? Our waitress was new and wasn’t sure which would be better on these nachos, chili or buffalo chicken, so she kindly suggested a half and half. Appearance: (7) A hill of nachos indeed, but a lot of warm tones. They might have been better had we ordered guacamole (see below: Price). Quality of Ingredients: (7.6) We loved the homemade chips, which were thin, crispy and delicious. We enjoyed the chili as well, and we were VERY pleasantly surprised that the buffalo chicken was spicy, well-cooked, and…actually good! Distribution of Toppings: (7) It’s hard to speak on distribution because of our unconventional order; however, even with only half of the chili there was plenty to go around (we do predict that the nachos with strictly chicken might be a little dry). The homemade chips held up fairly well to the chili. There was some weird melting action going on with the cheese– there were pockets of completely unmelted cheese right next to burned chips, which made little sense. Price: (3) Here is where things fall apart. The basic nachos are $10; if you want chili or chicken it’s an extra $4, guacamole is an extra $2. We were floored at the idea of $16 nachos– what is this, Game On!? Actually, Game On! was $1 cheaper an five of us nearly killed ourselves trying to finish them. These were easily demolished by three, with room left over for entrees. Sure, the quality was good, but we’ve had better and for less. Overall: 24.6/40. Drop the price a little bit, and these are some high ranking nachos. Perhaps as this place grows into itself there can be some menu tinkering. In particular, we would love to see them attempt a real buffalo chicken nacho (with blue cheese, et al.) as we think they might actually be able to pull it off.